First published in 1934, Mary Thomas' Dictionary of Embroidery Stitches has long been a well-loved favorite of novice and experienced embroiderers alike! Updated by Jan Eaton, this indispensable handbook pictures and describes over 400 embroidery stitches, arranged by usage, ranging from basic outline and border stitches to more complex detached-filling and pulled-fabric stitches. This outstanding reference guide will enable all needle-workers to master the art of embroidery at every level, with clear, helpful photographs and step-by-step instructions. Now in paperback! Mary Thomas, author of the original edition of this book, was born in Wantage, Berkshire. She was educated in Music and art, and in her twenties went to America to work as a fashion artist for the New York Pictorial Review. At the outbreak of the First World War she returned to Europe, and went to France as an army nurse. After the war, she worked as fashion editor of the Gentlewoman, and in 1930 became editor of the Needlewoman. She took up freelance writing in 1936. 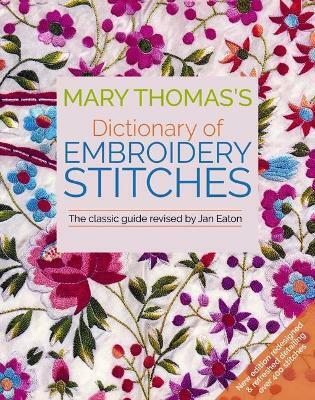 Mary Thomas's Dictionary of Embroidery Stitches, published in 1934, was the first of her highly successful books, and it was followed in 1936 by Mary Thomas's Embroidery Book. Although embroidery was, of course, her first subject, she also developed an interest in knitting. In 1936, she began work on an exhaustive compendium of knitting history and techniques, which was published in 1938 and 1943 in two volumes. Both her embroidery and her knitting books have remained in print for nearly half a century, and are regarded as standard reference works for the techniques of these crafts.